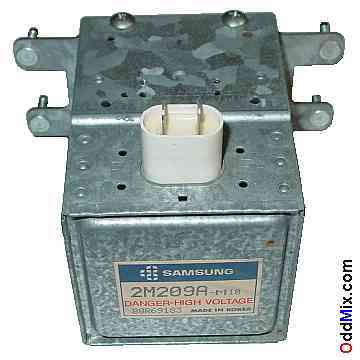 This is a genuine Samsung 2M209A-M10 magnetron, a high power, microwave oscillator vacuum tube. This hard to find and DANGEROUS replacement tube is made for ovens like some General Electric models JE47 or JE48 and others. This device is also useable for many other experiments, show-and-tell, for instruments, super high-frequency power amplifier devices and parts source. It has two strong toroid (ring) shaped ceramic magnets. Data For Reference Only - no longer available!